A gothic fairy tale retelling with a bad boy in a fedora? Yes. This is perfection. If you love dark fairy tale retellings, skeletons and all, you will love this series. A.G. Howard created the perfect great-great-great-granddaughter to the original Alice we all know…but we don’t actually know the truth. I loved all the twists this version showed in regards to the original tale, and I adored how the affects of a different speaker caused a unique take on Wonderland. Personally, I loved Morpheus the most. His character was just so vivid and lively despite his darker nature. A beautiful nightmare turned into a fantastic fairy tale. Recommended to: fans of fairy tale retellings, gothic-themed fantasy, and bad boys with fedoras. Favorite Quote: Sometimes a flame must level a forest to ash before new growth can begin. 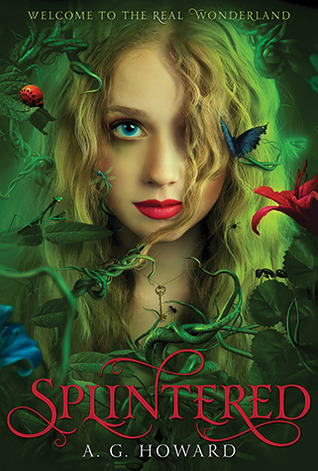 Sign into Goodreads to see if any of your friends have read Splintered.